We often think of the city and the country as separate, and that development planning and urban sustainability ends at the city boundary. But this isn’t true—in a planning and sustainability sense, the city and the surrounding rural areas are deeply linked. With this in mind, I would like to discuss a plan for the sustainable coexistence of a section of forgotten rurality near the megacity of Bogota, Colombia, and how a civic response is being molded to draw attention to the issues involved. Safeguarding a section of the Bogota countryside should be a transversal management concern for all local public administrators. Bogota’s metropolitan land area is 75 percent “rural” with 1 percent of the population and 99 percent is found in the 25th percent that correspond to the urban area. This scarcely-populated region of the countryside is home to the Sumapaz high mountain meadow (one of the largest in the world), which is the source of much of the water consumed by the city below; its soil yields abundant agricultural output, and it is a major ecological corridor in the region. 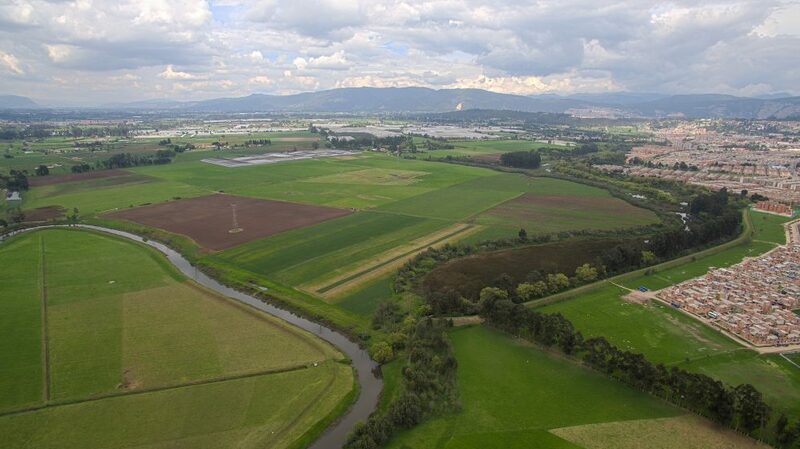 At the moment, much of Bogota’s countryside is filled with agro/eco systems and nature reserves. The Thomas Van Der Hammen Nature Reserve is set within the Bogota countryside: this 1,400 hectare reserve, put into the Public Trust more than 15 years ago, serves as a green corridor that links the city’s eastern mountain border to its northern-perimeter marshlands and then makes its way to the banks of the Bogota River, which lies at the city’s western edge. This nature reserve environmental plan has been divided into 6 percent percent conservation area, 44 percent percent sustainable use, 40 percent restoration, and 10 percent for landscape protection. Its development will have an enormous impact on the region’s ecological future. At the moment, the future of this Nature Reserve is uncertain, due to the fact that the current Mayor of Bogota (as of 2016) has suggested he would like to modify the Reserve’s bylaws—which consecrate its exclusive conservation use—and open it to housing construction. The mayor’s proposal has been controversial: proponents and opponents are widely separated on the issue, with both claiming that judicial and institutional regulations support their respective viewpoints. In this article, we will offer the Fundación Cerros de Bogota’s1 [Bogota Mountain Reserve Foundation] position on these issues. 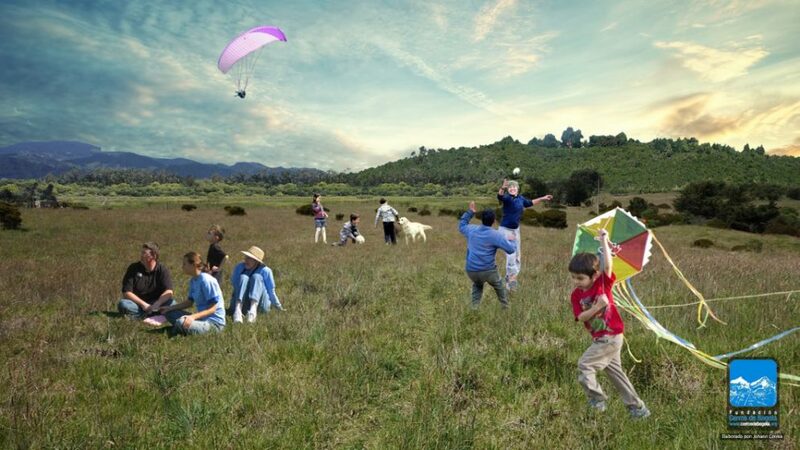 We believe that the Thomas van der Hammen Nature Reserve holds enormous potential for Bogota’s metropolitan population of 9 million people that can be turned into a public scenario for ecological and educational activities. Our goal is to protect the Reserve’s landscape and to work with all concerned so that this key urban and regional ecological resource does not become a hostile zone that pushes people apart. On the contrary, we, at the Mountain Reserve Foundation, hope to bring people together, in a peaceful setting, to actively, consciously, and constructively discuss the Nature Reserve’s future. The cultural value of Bogota’s countryside landscapes and activities associated with soil quality and cultural and agricultural value. The resilience of a landscape typified by river and rainfall flooding. The diversity of recreational and ecological activities for the region’s population. The contribution of biodiversity and the economic challenge of preserving public nature reserves. The nation’s population policies, which transcend this discussion. The founding of the Thomas van der Hammen Nature Reserve in 1999 marked a milestone for the defense of biodiversity; its ongoing conservation also bears testament to the success of grassroots ecological movements joined by the Colombian National Academy of Science in helping to establish a new urban development model. Their joint campaign to place the Reserve in the Public Trust began with its being approved first by the Regional Natural Resources Agency, or CAR, and later, by other pertinent governmental entities. At this moment, it is important to recall these legal underpinnings upon which the Reserve’s Public Trust rests when the public interest is being challenged by legal claims put forward by construction companies. In contrast to the van der Hammen Reserve’s precise legal status, the case of Bogota’s eastern mountain border—the region’s greatest cultural and ecological patrimony—has been marked by a long period of official regulatory limbo that has allowed growing urbanization in a deteriorating landscape. We do not want the same thing to happen to our other public nature reserves. The Thomas van der Hammen Nature Reserve holds enormous potential for environmental restoration, outdoor recreation, and public land use. 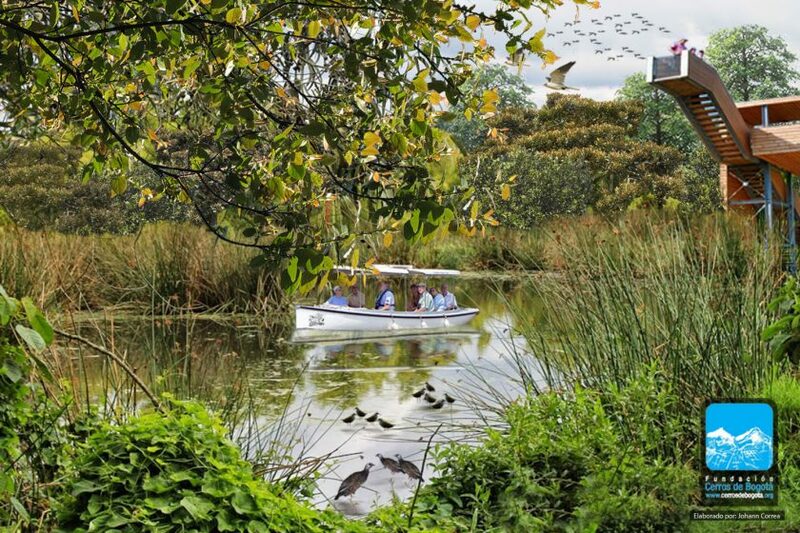 Developing all of these would improve the quality of life and the availability of recreational activities for the people of Bogota, and at the same ensure the region’s ecological connectivity. 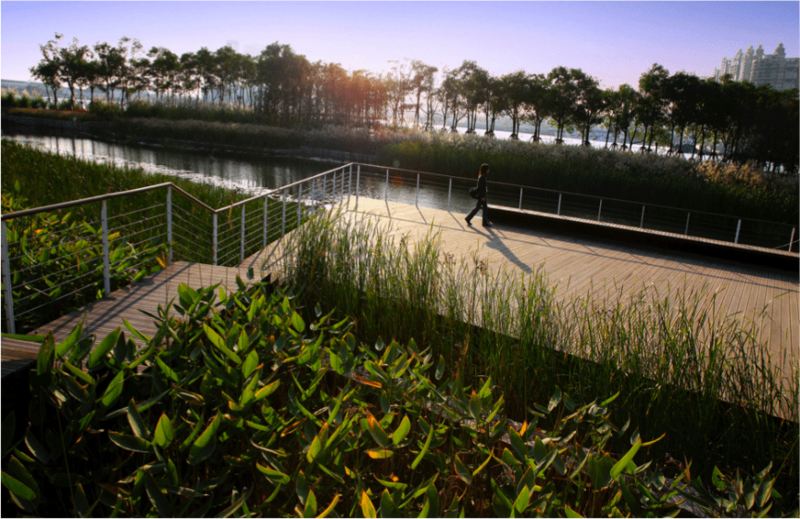 Therefore, the van der Hammen Nature Reserve should be classified into both the city’s Ecological Master Plan and into its system of parks and recreation. Assignment to both categories is very important; even if it could sometimes bring about a clash of interests, these could eventually be reconciled as the resource-use policy is being put into place2. Currently, the Natural Resources Master Plan takes these two roles—ecological and recreational—into account. However, they need to be analyzed to a greater degree so that they can be successfully integrated into existing programs. To make sure that this inertial situation is not the final scene—an outcome that neither those who favor housing construction in the van der Hammen Reserve nor those who oppose it would like to see—we have put together an image of what haphazard construction, carried out under the risk of floods, would look like and how it would degrade the landscape; something similar has already happened near the banks of the Bogota River. See Image No. 2. The argument that allowing supervised building in the van der Hammen Reserve would help bring an end to the urban sprawl over most of the Bogota plateau is similar to the argument that if housing construction in the Bogota Mountain Reserve were permitted, then the Bogota countryside would stop being divided up into building sites—particularly in the satellite villages of Calera and Sopo. But we, as active and aware citizens, know how difficult it is to create and defend a Nature Reserve; therefore, we are making an urgent request to seek out alternatives to building inside a nature reserve. One such alternative would be to encourage greater housing density inside the city itself in central areas such as those around the Simon Bolivar Park where infrastructure and recreation facilities already exist, or in other zones near thoroughfares and ongoing urban renewal projects. 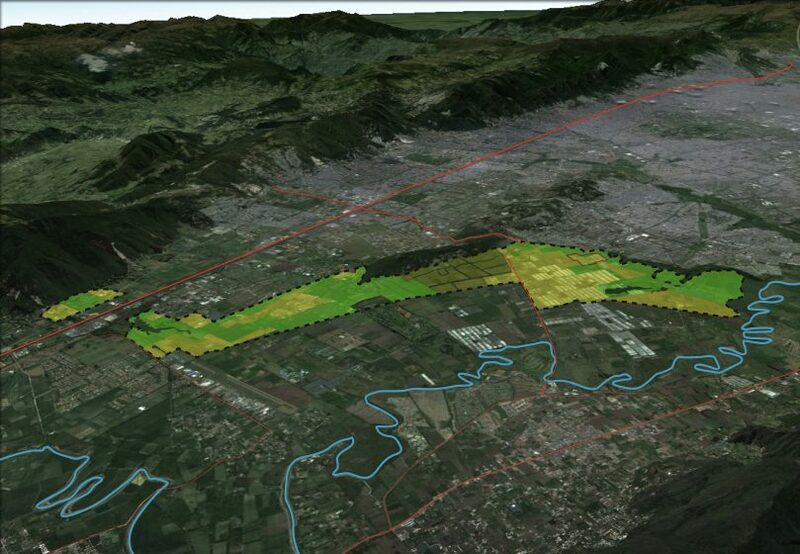 The effects of urban sprawl concern the entire nation, so whether the van der Hammen Reserve exists or does not is not truly essential to solving this issue, particularly in the case of the urban sprawl around Bogota’s satellite towns and cities on the high mountain plateau. Each municipality and city government have their own zoning laws. Therefore, what is urgently needed is a regional network of city governments working together to hold back urban expansion. This concept was put forward in the Regional Zoning Master Plan in 2004. Let’s review a few examples of urban or suburban woodlands that have not been used for detaining urban development, but have, instead, contributed to the coexistence of a number of uses: recreational, productive, ecological. These forested areas function as nature reserves that benefit the local population affected by climate change—and in the conservation of eco-systems. There are examples from China, Mexico, Argentina, Germany and Canada, to name just a few that illustrate how conservation can be integrated with sustainable cultural, patrimonial, educational, and scientific activities. Hountain Park in Shanghai, China. 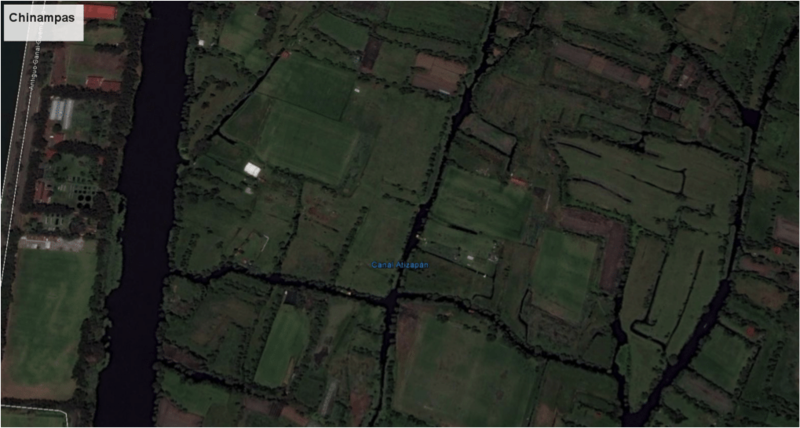 An industrial and agricultural zone with public access. 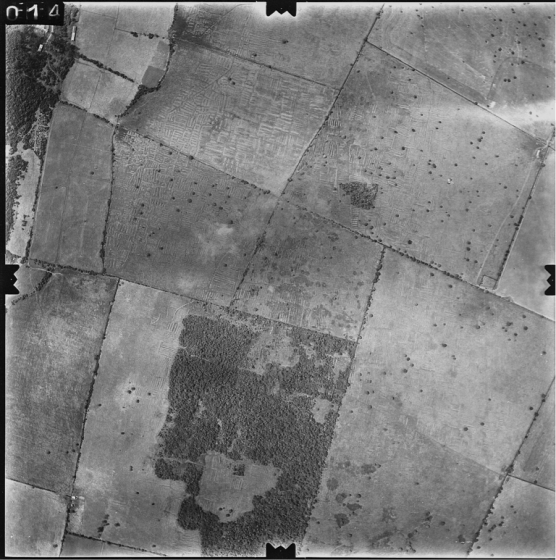 Recuperation of Pre-Columbian agricultural techniques (camellones), amphibious parks and lakes in the Conejera marsh and along the banks of the Bogota River. Images by Diana Wiesner, production by AYP team. 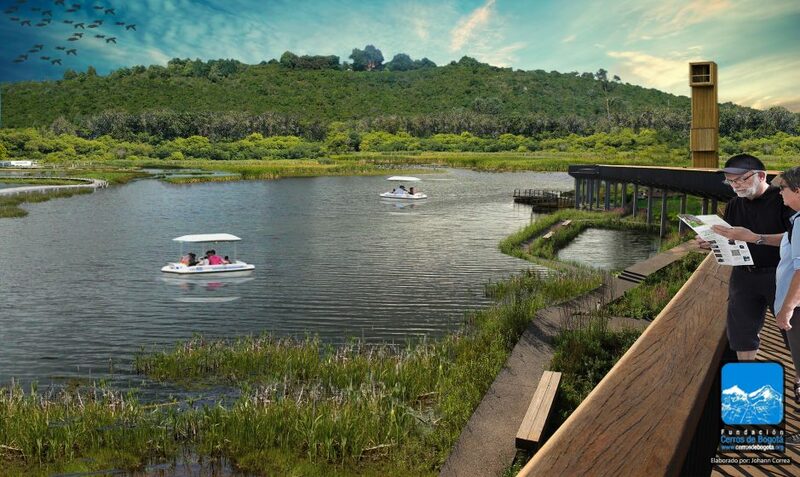 Our proposals for the van der Hammen Nature Reserve echo the recommendations included in the Regional Master Plan: greater public access to the park, commercial agriculture with an experiment station, on-site research projects, and educational and training centers. So that this Nature Reserve can be transformed into the park we have been describing, its land use titles need to be secured through binding agreements on the legal transfer of building and contractual rights, so that its long-term use for public and ecological services can be assured. Grassroots organizations are invited to share their ideas on how to make the Reserve economically viable. These proposals should be placed within the proper legal framework and focus on serving the public interest. Our public use proposals are centered on recreation, sustainability, and agriculture that will evolve in amphibian spaces, resilient landscapes, and naturally fertile meadows, instead of in the Reserve’s current kikyograss pastures; our fields would be seeded with wild plants, where pre-Columbian mounds could be built up and used for a number of purposes, including weekend family outings, school excursions, and as park facilities for residents in the city’s Northern Zone. Woodlands and lake project for recreation and bird watching. Produced by J Correa for Diana Wiesner. Why only one piece of land? Keeping the Reserve intact in one continuous land mass safeguards the area against flooding, provides generous spaces for sports and recreation, and enhances environmental conservation; but, above all, this unbroken land mass fulfills a cultural function by preserving the Bogota plateau landscape in the northern part of the city. It is important to keep in mind that any landscape should be regarded as a complex entity that combines natural and cultural values, both tangible and intangible. In this specific landscape, the rural past and present come together in the north of Bogota. We are encouraging citizen groups to take part in the protection of this irreplaceable piece in the local countryside. A fertile and diverse gateway to Bogota. Produced by Diana Wiesner with the collaboration of Apertura Visual digital image. In a final note, the plans for the highway system that would run through the Gateway to Bogota area in the north of the city should keep the region’s interlocking ecosystems in mind. This can be done by building overpasses in the Torca and Guaymaral marshlands. These structures would stand as landmarks for a competitive city, one linked by functional and fertile thoroughfares that protect its socio-ecosystems. This socio-ecological asset, located on the Bogota Plateau, will be a cornerstone in future plans for Bogota and the region. Safeguarding a section of the Bogota countryside should be a transversal management concern for all local public administrators, and it should be included in the Regional Zoning Master Plan. Projects for sports, camping, plant nurseries, flower shows and recreation. Produced by Johann Correa for Diana Wiesner. 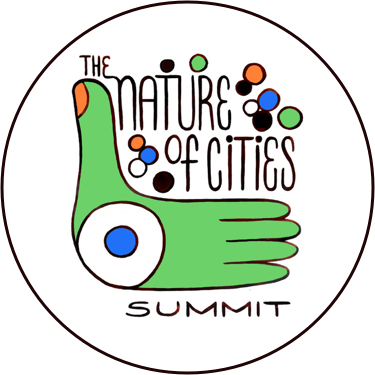 What will the role of the countryside be in the city without borders? The Bogota Mountain Reserve Foundation is participating in the current debate on the future of the van der Hammen Nature Reserve, in part, because we feel it is important to defend community achievements. The people of Bogota should be supported in their search for legal counsel in preserving their environmental heritage—in this case, the van der Hammen Nature Reserve, which is part of the countryside in a fertile and biologically diverse city. We are putting together a participatory tool that will aid citizens when dealing with governmental agencies in the decision-making process on nature reserves. 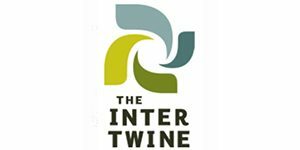 We believe that conservation of the countryside is of the utmost importance in a country that is committed to weaving a peaceful social fabric. 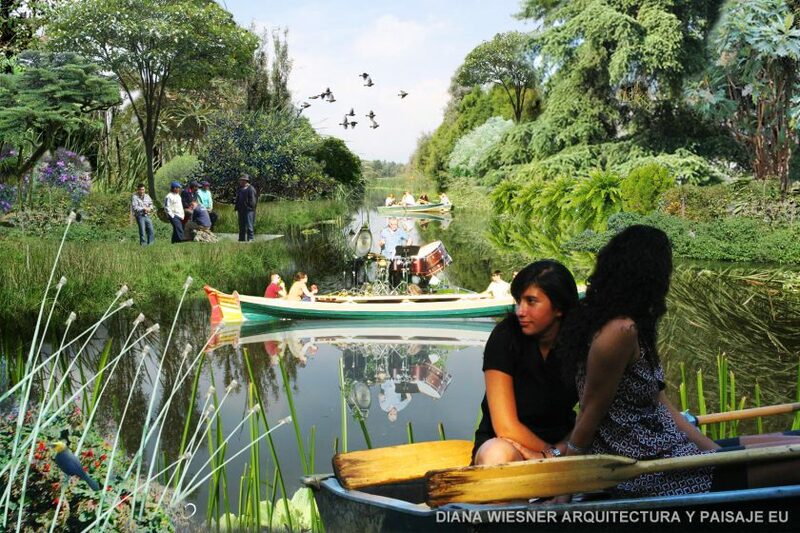 This article is based on a presentation given by Diana Wiesner-Ceballos at the Colombian State Council Forum, “Challenges for Bogota: The Bogota City Council Debates the Thomas van der Hammen Nature Reserve”, on April 18, 2015 in the Julio Mario Santo Domingo Library, Bogota. 1. Fundacion Cerros de Bogota: www.cerrosdebogota.org We belong to a group of civic volunteers whose representative is the Bogota Mountain Reserve Foundation (Fundación Cerros de Bogotá), a civic organization dedicated to the conservation, care and public use of the Bogota Mountain Reserve and a Member of the Verification Committee on the Council of State ruling. La mayor atención de los estudios, planes de ordenamiento y la gestión territorial está concentrada en las zonas urbanas. Sin embargo, se ignora el papel y la importancia de las áreas rurales de las grandes ciudades, las cuales terminan siendo el resultado de la dependencia funcional con la ciudad y de los sistemas de servicios entre áreas urbanas colindantes. Por lo anterior, pongo a consideración un caso de la ruralidad olvidada en la Sabana de Bogotá, Colombia y la posibilidad de habilitar una herramienta de participación ciudadana que ponga en relieve la viabilidad y futuro sostenible de estas áreas en coexistencia con las grandes urbes. Garantizar una pieza del Paisaje Rural de la Sabana dentro del área rural de Bogotá debe ser un propósito transversal a cualquier administración de turno y debe quedar incluida dentro del Plan de Ordenamiento. En la ciudad de Bogotá, el territorio rural ocupa el 75% de su área total y contiene tan solo el 1% de la población capitalina. En esta área se encuentra uno de los páramos más grandes del mundo, el páramo de Sumapaz, el cual provee parte del agua que consume la región y el suelo de estas áreas rurales tiene una calidad alta agrológica y de conectividad ecológica. La principal función de las áreas rurales es para los agro ecosistemas y las reservas naturales. En contraste, el area urbana de Bogotá ocupa el sólo el 25% del área total del territorio y contiene con el 99% de su población. En la actualidad la zona rural de Bogotá cuenta con la Reserva Thomas Van Der Hammen, ésta fue declarada por la Sociedad Civil desde hace más de 15 años y cuenta con una extensión de 1.400 hectáreas, siendo su principal función la conectividad ecológica entre los ecosistemas de los Cerros Orientales, la cadena montañosa que colinda con el borde oriental de la ciudad, los humedales del norte de la ciudad y el Río Bogotá, el cual bordea la ciudad al occidente. Esta Reserva tiene 6% de área de conservación, 44% para uso sostenible, 40% para restauración y 10% para protección del paisaje, tiene un enorme potencial para el futuro ecológico de la región. Actualmente, el futuro de la reserva es incierto debido a que la actual administración distrital está planteando la posibilidad de modificarla para ubicar vivienda al interior de la misma, esto ha sido objeto de enormes polémicas en la ciudadanía, provocando una gran polarización respecto al futuro de la Reserva, haciendo que se afecte la institucionalidad y la estabilidad jurídica que permitió consolidar esta área. En el presente artículo se presenta la posición de la Fundación Cerros de Bogotá1 frente al debate del futuro de la reserva, la cual consiste en poner a consideración un imaginario del potencial que tiene dicha reserva para la población de la región: un área de uso público y aprovechamiento ecológico y pedagógico para los 9 millones de habitantes de la capital. La propuesta busca que la protección del Paisaje y que el fortalecimiento de la Estructura Ecológica Principal de la ciudad, y de la región, no se convierta en una confrontación ideológica que genere polarización, sino por el contrario que la coyuntura permita abrir posibilidades de enriquecer la discusión. Es por ello, que se hace una invitación a fortalecer un dialogo propositivo y una participación activa y consciente, acciones propias de una cultura de la paz. El valor cultural del paisaje rural de la Sabana de Bogotá y las actividades asociadas a la calidad del suelo. La funcionalidad de un paisaje resiliente a la inundación congruente con la dinámica del río y las lluvias. Una oferta recreativa y ambiental diversa en intensidades para la población de la región. La contribución a la biodiversidad y el reto económico de garantizar la realidad de reservas Naturales declaradas. La política poblacional a nivel nacional que trasciende esta discusión. La constitución de la Reserva Thomas Van Der Hammen en el año 1999 representó un logro ciudadano en la defensa de la biodiversidad, en este sentido, su conservación significa, también, el reconocimiento de los esfuerzos de la Sociedad Civil y de la Academia Nacional de Ciencia por la adopción de un nuevo modelo de desarrollo urbano. La propuesta técnica de la iniciativa ciudadana fue avalada por la CAR y por las instancias judiciales. Si se reivindica la seguridad jurídica para los empresarios, es igualmente válido brindar estabilidad jurídica para la planeación en las decisiones de interés colectivo. Los cerros orientales, mayor patrimonio natural y cultural de la región ha sido víctima de un largo limbo jurídico que ha permitido mantener su presión de urbanización y deterioro. No queremos ese futuro para otras reservas declaradas. La Reserva Thomas Van Der Hammen tiene un potencial de restauración, recreación y uso público, que contribuiría significativamente a mejorar la calidad de vida y la oferta recreativa de los bogotanos, al mismo tiempo permite que esa área favorezca en el futuro la conectividad ecológica regional. En este sentido, la Reserva es vista como parte de la Estructura Ecológica Principal y a su vez como parte del sistema de parques recreativos de Bogotá: dos valoraciones igual de importantes, que implican miradas diferentes, complementarias e integrales2. En el escenario actual, el Plan de Manejo efectivamente permite y contempla estas dos miradas, aunque es necesario profundizar en la coexistencia de los usos para recreación y las actividades existentes. Posible escenario inercial en caso de no hacerse nada. Fotomontaje de Diana Wiesner realizado por J. Correa. Para evitar el escenario inercial que ninguna de las propuestas a favor de la urbanización o a favor de la permanencia de la Reserva quiere que suceda, se elaboró una imagen de lo que podría ser la construcción no planificada con riesgo de inundación y deterioro del paisaje como sucede en varios de los sectores de la Zona y Manejo del Rio Bogotá. Ver imagen N 2. Frente a la posibilidad de urbanizar el área, se considera que defender la construcción planificada de la Reserva en aras de frenar la urbanización de la sabana en los municipios vecinos es equivalente a decir que urbanizar planificadamente los cerros garantizaría detener las parcelaciones campestres y urbanizaciones de los Municipios de la Calera y Sopo. En este sentido, como ciudadanos que sabemos lo que cuesta lograr un proceso de defensa como estos, solicitamos respetuosamente, agotar los escenarios posibles de densificación en lugares que ya presentan infraestructura y servicios recreativos como el área próxima al Parque Simón Bolívar, los corredores de movilidad y zonas de renovación urbana. Asimismo, se considera que el tema de la expansión urbana trasciende a esferas nacionales, pues la existencia de la Reserva tampoco garantiza que el proceso de expansión urbana en los municipios circunvecinos de la Sabana de Bogotá se vaya a detener, debido a que ya existe una interdependencia funcional entre los mismos. En este sentido, se debe inducir la contención de dicha expansión como un tema prioritario de las agendas de gestión y bajo la estrategia de red de ciudades regionales y el Plan de Ordenamiento de la ciudad desde el año 2004. Antes de mostrar el potencial que vemos en la Reserva, se revisaron ejemplos de bosques urbanos o periurbanos que no buscan ser contenedores de desarrollo sino mostrar la posibilidad de coexistencia de usos recreativos, productivos, reservas ecológicas en beneficio de una población y acordes a principios del cambio climático y de los servicios eco sistémicos. Ejemplos en China, México, Argentina, Berlín, Canadá, por nombrar algunos, demuestran la posibilidad de integrar usos de conservación con usos sostenibles de carácter cultural, patrimonial, educativo, científico, entre otros. Parque Hountain en Shanghái – China. Una zona Industrial y de agricultura recuperada para uso público. Se pone a consideración un escenario que sigue las pautas de Plan de Manejo existente y potencia el mayor uso público posible en el área: proyectos-negocios de un gran parque fértil, de investigación, un centro de producción experimental, centros de formación y educación. Recuperación de Camellones de Cultivo, parques anfibios y lagos para apoyar la función de humedal la Conejera y Rio Bogotá. Imágenes de Diana Wiesner elaboradas por equipo AYP. Para que este gran parque sea viable proponemos estructurar una gestión integrada del suelo mediante diversos instrumentos tales como transferencia de derechos de edificabilidad y transferencia de cesiones, que garanticen a largo plazo la consolidación del uso público y la prestación de servicios eco sistémicos en beneficio de la ciudadanía. Es igualmente importante, garantizar mecanismos participativos que permitan escuchar las diferentes propuestas ciudadanas que garantizan la viabilidad económica de la reserva, entre las cuales se incluye el respeto a la estabilidad jurídica y al interés colectivo. Dentro de estas propuestas, sugerimos pensar espacios anfibios, resilientes, recreativos, sostenibles, agrícolas, praderas naturales fértiles que sustituyan en kikuyo en los cuales pueda haber un área de uso público. Los potreros pueden ser praderas silvestres entre camellones recuperados para diversos usos, desde zonas recreativas para los fines de semana de la familia, para el uso de colegios vecinos o vecinos de la desarrollada urbanización del Plan Zonal del Norte. bosques y lagos proyectados para la recreación y la observación de aves. Elaborados por Johan Correa para Diana Wiesner. ¿Porque en un solo globo de terreno? Un solo globo de terreno garantiza espacios de mitigación de inundación, brinda oferta recreativa en grandes espacios de múltiples usos, lograr mayor funcionalidad ecológica, pero sobre todo garantizar una única pieza de paisaje cultural rural de la sabana en la zona norte de la ciudad. Por lo anterior, entender el Paisaje como realidad compleja que integra valores naturales y culturales, tangibles e intangibles, e identifica el carácter rural de la zona norte, es fundamental para garantizar esta pieza del paisaje sabanero como el mayor logro colectivo para la región, invitamos a la ciudadanía a sumarse para consolidar una visión compartida y proponer el mejor escenario posible. Umbral de Bienvenida a Bogotá como ciudad Fértil y diversa. Elaborada por Diana Wiesner apoyo Apertura Visual imagen digital. Por último, la conectividad vial del Umbral de bienvenida de Bogotá debe darse en trazados coherentes con el respeto y conectividad de los ecosistemas mediante viaductos elevados que permitan la integración de los humedales de Torca y Guaymaral, y sean referentes de una ciudad competitiva, conectada funcional y fértil que protege sus socioecosistemas. Este valor socio ecológico de la Sabana es un componente fundamental para integrar dentro de las variables importantes dentro de la planificación de Bogotá y la región. Garantizar una pieza del Paisaje Rural de la Sabana dentro del área rural de Bogotá debe ser un propósito transversal a cualquier administración de turno y debe quedar incluida dentro del Plan de Ordenamiento. Imaginario del área con zonas deportivas, camping, viveros distritales, exposiciones de flores y juegos. Elaborado por Johann Correa para Diana Wiesner. ¿Cual será el lugar de la ruralidad en una ciudad sin fin? Para la Fundación Cerros de Bogotá, una parte importante del debate es la defensa de los logros de la sociedad civil, con lo cual se busca dar estabilidad jurídica a las decisiones tomadas y ampliar la participación de los habitantes en torno a sus patrimonios naturales, debido a que la reserva Van der Hammen es un acto ciudadano para una ruralidad y una ciudad fértil y biodiversa. En este sentido, se propone una herramienta de participación ciudadana para que cualquier ciudadano se pueda informar de la problemática y a partir de ello, pueda y poner a consideración de la actual administración sus propuestas con el fin de enriquecer democráticamente las desiciones sobre Reservas Naturales declaradas y que se logre una gestión y administracion que garantice su viabilidad. Lo anterior, permite que la ruralidad vuelva a tomar el espacio que requiere en medio de una sociedad que está tejiendo su proceso de paz. Este artículo está basado en una presentación hecha por Diana Wiesner Ceballos en el debate de Control Político, “Retos de Bogotá: El Consejo de Bogotá debate la Reserva Thomas Van Der Hamen”, en abril 18 de 2015 en la biblioteca Julio Mario Santo Domingo, Bogota. Somos parte de un grupo de ciudadanos voluntarios representados en la Fundación Cerros de Bogota, organización ciudadana que vela por la conservación, cuidado y apropiación cívica de los Cerros de Bogotá y miembro del Comité de Verificación del Fallo de Consejo de estado. Contribuciones de un grupo de pensamiento sobre la RVDH dadas por Alberto Galán. La valoración del Paisaje Cultural de la Sabana De Bogotá es un argumento estructural para su defensa. La Reserva Van Der Hammen, declarada y viva es la última pieza del paisaje rural dentro de Bogotá ñ. Una oportunidad para conservar el paisaje de la Sabana dentro de Bogota. Particularidades culturales y naturales que no deberían fragmentarse en un urbanismo que privilegia a una pequeña población. Generalmente los limites políticos no coinciden con lo territorial geográfico y de allí vienen muchos inconvenientes en la gobernanza e institucionalidad. Solo un aporte desde la orilla de los defensores del Paisaje. La reserva como una pieza del paisaje Rural de la Sabana de Bogotá debe pensarse desde lo cultural y lo social, no solo desde la ecología. Un honor para nosotros poder apoyar lo que ustedes han realizado como Sociedad Civil en la defensa de los procesos ciudadanos e institucionales. Sabemos que necesitamos diversos actores que puedan sumar en argumentos lo que puede ser un escenario viable. Felicitaciones por lo que han hecho y por el legado de tu familia y abuelo: Thomas Van der Hammen. Muy apreciados los comentarios. La academia debe participar para enriquecer la visión a futuro de nuestras ciudades latinoamericanas, en las cuales el tema de Naturaleza Urbana es aún incipiente. Las reservas urbanas o rurales en áreas metropolitanas aun requiere profundizarse, hablar de gestión de suelo, de biodiversidad y de claras herramientas para su viabilidad. Ojalá que todos los estudiantes participen activamente y sean apasionados del tema de ciudad, desde cualquiera de las orillas de forma proactiva y propositiva. Muy apreciados tus comentarios, dado que vienen de un grupo organizado a favor de la Reserva como lugar posible, Barbara artista, Sabina , nieta del profesor Van der Hammen, Alberto Galan, economista y todo un grupo que defiende la Institucionalidad y la posibilidad de lograr una visión conjunta y viable para la región. Pensar en urbanizar una reserva declarada no sería concebible en cualquier otra ciudad de Europa. Debemos ademas demostrar que urbanizando solo una población muy reducida privilegiada viviría allí, con un costoso urbanismo que tendría riesgo de inundación y cuyo costo de suelo equivale solo a un tramo de transmilenio. No podemos pensar en grande y darnos el privilegio de tener un parque rural de la sabana para la región? Acaso no podemos lograr pensar con la Alcaldía las figuras posibles para que se gestione el suelo rural y se logre una primera etapa? Gracias Barbara, seguimos en nuestro compromiso con lograr la gestión integral de las Areas Protegidas ! Diana esta maravilloso el artículo, muchas gracias. El aporte que desde la mira de tu estudio le dan a la Reserva pensando el potencial de ruralidad que tenemos en la ciudad de Bogotá y la Sabana como elemento fundamental de nuestro entorno urbano, y la apuesta tanto de los Cerros de Bogotá como la Reserva con su Plan de Manejo como un reto para que entre todos podemos “construir” este paisaje natural y recreativo. El aporte en este sentido de los urbanistas y arquitectos es un ejemplo fundamental y valioso para otras disciplinas, y se amplifica cuando, como en este artículo y propuesta, se hace acercando y cuestionando la ciudad a la mano de científicos ambientales, quienes nos ayudan a comprender nuestros suelos, las plantas y aves que han habitado estos territorios milenariamente, aportando el cómo la urbe debe suceder orgánicamente y en correlación con la estructura dibujada y planteada ya por la naturaleza (biomimesis). 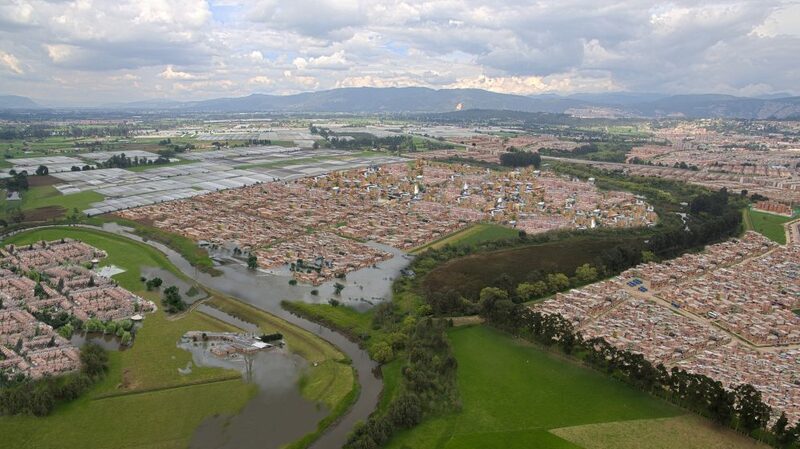 Queremos seguir construyendo sobre zonas inundables del río Bogotá y sus humedales? en vez de aprovechar este paisaje patrimonial único y aprender del ciclo del agua que en nuestra ciudad y la Sabana los cuales son realmente un tesoro. El agua es un tesoro, paciente pero agotable sino reaccionamos pronto y le damos el espacio que requiere, 800 metros de ancho en la reserva es lo mínimo para que la estructura ecológica se mantenga (y no fragmentado por 4 avenidas planteamiento sesgado del Alcalde actual) y colaboramos entre todos para que sea posible configurar un espacio de bienestar socioambiental. No es solo un problema de conservación, ni de riachuelos o humedales aisalados sino de conectividad ambiental más bien socioambiental de Bogotá y su ruralidad. La Reserva y los Cerros de Bogotá son hoy quienes sostienen una calidad de vida digna para todos los seres de la naturaleza y una apuesta común para entender qué clase de ciudad contemporánea y del futuro queremos ayudar a restaurar y habitar. De pronto Diana tiene una mejor respuesta que yo, pero me lanzo al ruedo a ver si puedo clarificar, a la manera que yo lo entiendo, estos cuestionamientos. 1. En práctica muchas veces esto no tiene mucha diferencia, es la finalidad es proteger un espacio de la urbanización o el desarrollo (ej. minería), pero conceptualmente distinguir los enfoques puede ser importante. La conservación ha sido un concepto manejado desde finales de siglo 19 con la creación de los primeros parques naturales mundiales, y está basado más que todo en el valor ecológico: protegeré especies en riesgo, ecosistemas únicos e irremplazables, fuentes de diversidad genética, etc. 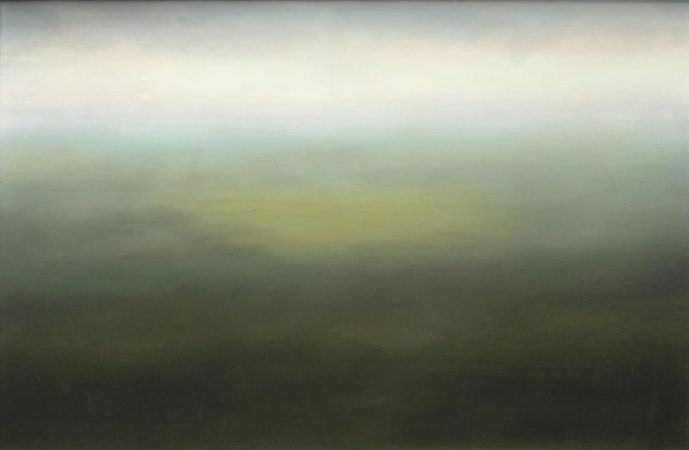 Proteger el paisaje es un enfoque moderno y que se basa en el valor cultural o ecológico de ciertos ecosistemas. En muchos casos, este enfoque tiene muchos paralelos con principios ecológicos, como los esfuerzos de la alcaldía de Bogotá de proteger los humedales, que tienen un valor ecológico importantísimo (hábitat de aves, regulación hidrológica, etc. ), pero también hacen parte del paisaje nativo de la ciudad, como los bosques de robles y pinos romerones y demás. Pero a veces este enfoque tiene una dimensión puramente cultural, como en la zona cafetera, especialmente en Risaralda, que se maneja el concepto de paisaje cafetero, que es una combinación de fincas esparcidas, cultivos de café, guaduas, y otras especies vegetales asociadas. Esto tiene poco valor ecológico, pues el café no es una especie nativa en Colombia y cumple una función humana más que todo, o la guadua, que, aunque nativa, fue promovida y esparcida por las montañas andinas para servir como material de construcción (originalmente, las guaduas no se encontraban en muchas partes de Colombia). Espero esto aclare un poco los distintos enfoques. Les métropoles du monde, avec leur croissance démographique sans relâche, imposent des questionnements sur la localisation des nouveaux arrivants (en plus des habitants déjá sur place en quête d´espaces verts : migrations internes, déménagements vers la périphérie). Bogota n´échappe pas á cette problématique, voire elle illustre une Amérique latine majoritairement urbaine, et a du mal á gérer sa surpopulation. Souvent, les faiseurs de villes ont tenu á conserver des espaces non bâtis (ceintures vertes, parcs de grande échelle, bois, quaies…) afin de proposer une poche d´air pur, espace de loisirs, en prévision de l´étalement urbain. Pourquoi oublier les lecons apprises et empêcher aux habitants de la región de la Sabana de Bogotá, des villes voisines de Cundinamarca et des départemets limitrophes, ainsi qu´aux touristes qui traversent le territoire, de jouir d´une réserve naturelle (á aménager), déclarée ainsi depuis plus de vingt ans, porte d´entrée (aujourd´hui) d´une capitale qui se veut durable, innovante et compétitive ? Merci á l´équipe de la Fundación Cerros de Bogotá et en particulier á Diana W. de permettre le débat sur des thématiques d´intérêt général, pas assez soutenues, et faire de porte parole. Me encuentro muy de acuerdo con lo dicho anteriormente en el articulo ya que día a día somos menos concientes de la importancia y mantenimiento de la Estructura Ecologíca Principal de nuestra ciudad; pues al llevar a cabo la propuesta de nuestro actual alcalde, el planteamiento de consolidar esta EEP se vería interrumpida. En este caso particular, al crear un tipo de espacio publico que se aproveche para realizar distintas actiividades ya sean de esparcimiento, educativas o en pro de la misma reserva, hace que esta área brinde a la sociedad un espacio lleno de vitalidad; que en mi opinión no hay suficientes en Bogotá. Finalmente considero que es realmete importante pensar en el futuro de nuesras ciudades ya que el desarrollo de ellas no significa crecer o expandirnos en área pasando por encima de aspectos naturales tan importantes como lo es en este caso la Reserva. Felicidades por el artículo. Una propuesta como esta en la que se aprovecha la reserva con actividades híbridas de conservación y recreación, no solo puede acercar a la ciudadanía a este patrimonio ambiental de la sabana sino que ademas podría cerrar el debate sobre urbanizar estas tierras para el futuro. El debate esta abierto, se hace necesario saber cuales son las prioridades a la hora de realizar una posible intervención en la reserva y que su impacto no genere repercusiones dañinas en un futuro. Es de vital importancia como a partir de las diferentes formas de urbanizar se pueden iniciar diferentes dinámicas integrales que permita dar estabilidad a la gestión que se lleve a cabo en ella. Gran artículo! Gran artículo! Es el momento de replantear el crecimiento urbano dándole énfasis al territorio geográfico y ecológico no a los límites políticos establecidos. Gran artículo! Es el momento de replantear el crecimiento urbano dándole énfasis al territorio geográfico y ecológico no ha los límites políticos establecidos. Felicidades a la autora y sus colaboradores por el desarrollo de este artículo, que entrega valiosas herramientas de análisis desde la sostenibilidad urbana en diálogo con el ambiente y la técnica profesional del paisajismo, en el marco particular de la región, lo que permite definitivamente ilustrar el estado a propiciar en el futuro de la cuidad, al tiempo que puntualiza los fundamentos a tener en cuenta desde las vías jurídico-administrativas. Interesante artículo, felicidades de nuevo. Según el plan de manejo ambiental de la CAR para la Reserva, el área de preservación esta destinado a evitar la alteración, degradación o alguna transformación del ecosistema por la actividad humana. En el área de restauración, el restablecimiento a un estado anterior de la biodiversidad ecológica, mantenimiento y favorecimiento del desarrollo de especies nativas y ecosistemas regionales. Estas dos áreas cumplen con el uso forestal protector con especies nativas y restauración ecológica. Protección al paisaje, son áreas declaradas como monumentos o áreas de conservación por sus valores históricos, ubicada aquí La Hacienda La Conejera, se permiten actividades controladas agrícolas, ganaderas, forestales, bajo un esquema compatible con los objetivos de conservación de la reserva. Esta propuesta supera el debate polarizado entre conservacionismo y urbanización, evidencia la importancia del espacio público de carácter metropolitano con múltiples usos y como vestigio de la historia natural y cultural de la Sabana de Bogotá. El perímetro de esta área tendrá un interesante potencial para la urbanización articulada a los sistemas estructurantes (movilidad, equipamientos, saneamiento, ect). Podría comparase con el Central Park: a nadie se le ocurriría urbanizar el parque pero los predios aledaños si que son objeto de especulación inmobiliaria. Maravilloso artículo. Es una clara invitación para avanzar en la consolidación de la Reserva como un espacio vital para una ciudad de las dimensiones de Bogotá. Ante la falta de acción de las entidades públicas en la consolidación de la Reserva, esta propuesta que hace Diana desde la Fundación Cerros de Bogotá es un avance muy importante para que, como ciudadanos, contemos con herramientas propositivas en este debate. The question is why are we unable to unleash that potential!!! Importantes reflexiones a considerar . Gracias por los comentarios y preguntas. 2. De acuerdo, Tenemos un plan zonal en el norte que puede desarrollarse, los corredores viales de movilidad pública, los bordes de parques metropolitanos como el SIMON Bolivar, zonas del centro de la ciudad etc. 3. El aporte en m2 de parque por habitante aumentaría como mínimo en 1 m2 de Parqie pr habitante y mejoraría la oferta recreativa de los ciudadanos que duran hasta dos giras encerrados en carros para salir a la sabana a buscar algo de campo. Gracias por sus comentarios . Las reservas deberían ser sagradas para el uso que fueron destinadas: el bien Comun. Una reserva de suelo fértil puede ser un ahorro en posibilidades para las futuras generaciones y no debería buscarse cambiar por el beneficio de unos pocos. La institutionalidad es algo que debe ser transversal en los procesos que se logran con grandes esfuerzos, para el bien Comun. Este proceso lleva más de 15 años y la ciudadanía se ha venido sumando para seguir adelante con una reserva posible y viable. Gracias por sumarse en interés y apoyo. We are committed . Hopefully many citizens join an participate in a positive way. We wanted to give an image of what is possible for people and future. This is a Big discussion now, and people need to have options respecting processes and civic work. Thank you for your comments. We hope our city will have the best option. Acho muito pertinente este articulo para a problemática da ruralidade nas cidades metrópoles, estes espaço além de ter uma importância gigante na conectividade ecológica da região, é uma fronteira que permite a cidade ter seus limites definidos, assim, as cidades satélites não vão se juntar na cidade principal, como é o casso de muitas cidades ao redor de São Paulo. A funcionalidade das reservas naturais deve ser, como o artigo propõe, biológica e social ao mesmo tempo e sua planificação deve ter permanência acima do prefeito do momento, já que o urbanismo é pra os cidadãos mas não pra politica. Assim, a sociedade civil deve mostrar também seu poder de decisão e execução nos lugares que habita. Muitos parabéns Diana pelo artigo! Let me praise not only the composition of this article – of which I may say it has been put down in an easy and understandable way for readers like me, who wouldn’t have a deep knowledge of the matter, and yet it makes a solid piece so as to profit from the ideas it presents- let me praise as well, the initiative of your foundation and the great team you work with. I think it’s essential that we all as citizens start getting aware of the real importance of ecological spaces like the Van Der Hammen reserve. Your conviction of protecting this area along with the purposal of making it at the same time a space for cultural and recreational activities, with a look towards sustainability is commendable. Thank you for this valuable article! 1° ¿Qué diferencias específicas tiene la categoría de “área de conservación” y de “protección del paisaje”? 2° Me parece muy pertinente la afirmación de : “Agotar los escenarios posibles de densificación en lugares que ya presentan infraestructura y servicios”. Esta es una problemática grave en especial en las ciudades intermedias en las que los suelos de expansión casi que doblegan el área del casco urbano y no consideran los procesos ecológicos en la expansión. 3°¿Podría uno contrastar los bajos porcentajes que tenemos en las ciudades de espacio público efectivo y poder argumentar que la conservación y el uso integral de áreas como esta reserva ayudarían al esparcimiento y recreación y que no tiene que estar relacionado directamente con malls comerciales como se tiende hoy en día? Felicitaciones por todo el esfuerzo y compromiso también de la Fundación Cerros de Bogotá. As the Bogota megalopolis continues to devour the plateau on which it is located, it is our generation’s moral and ethical obligation to help presreve what has been set aside for the public good. Hopefully, both national and international organizations will support the Bogota Mountain Foundation in its quest to do so. Muy buen artículo, comparto el pensamiento. La ciudad debe verse con un ecosistema, un tejido entre urbanización y sus reservas ambientales, cerros, humedales y quebradas, priorizando estas últimas. El respeto hacia los atributos ambientales de la ciudad debería ser el factor organizador de esta. Actualmente Bogotá debería considerar densificar zonas que ya cuentan con servicios en vez de expandirse a terrenos biodiversos y alterar el ciclo del ecosistema. Es importante cultivar este pensamiento de ciudad desde jóvenes. Bogotá tiene una sabana y un sistema de paramos único , la mayoría de los planes y las prioridades están centradas en el Area urbana., tanto el campo como sus habitantes no sólo en Bogotá sino en la mayoría de Colombia no han sido prioridad política y allí tenemos la mayor biodiversidad o valores ecológicos de la Region. Gracias por los comentarios muy pertinentes ! Seguimos en la defensa del paisaje ! De vital importancia pensar en el aprovechamiento integral y cultural del paisaje y de las piezas que aún nos quedan en la ciudad. Felicitaciones por tan excelente artículo! Definitivamente, el tener en cuenta los intereses de la ciudad como organismo sostenible se logra con estas ideas tan maravillosas! Casi 60% de la superficie de la Ciudad de México son zonas rurales, algunas tan célebres como las chinampas de Xochimilco, las nopaleras en terrazas prehispánicas de Milpa Alta o los bosques de Pino de Tlalpan. Tristemente nuestros gobiernos no reconocen la importancia de las zonas productivas rurales y las zonas naturales mitigadoras de impactos urbanos, para el funcionamiento y sostenibilidad de las zonas urbanas. Ahora están promoviendo un proyecto millonario de jardines verticales, en lugar de promover proyectos realmente relevantes en estas zonas vitales. Autoridades confundidas. Grandiosa inociativa la de ustedes!???? Gracias ., buscamos dar posibilidades para que la reserva sea viable y se proteja la institucionalidad y los esfuerzos ciudadanos por crear reservas para el futuro de la población de la Region. Excelente artículo y una llamada de atención para que la Sociedad de profesiones Afines al Paisajismo se pronuncie igualmente.